A new look at data from seismic experiments left on the Moon by astronauts has given researchers a better understanding of the lunar interior. 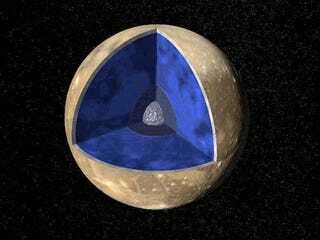 The Moon's core appears to be very similar to the Earth's - with a solid inner core and molten liquid outer core - and its size is right in the middle of previous estimates. "While the presence of a liquid core had previously been inferred from other geophysical measurements, we have made the first direct seismic observation of a liquid outer core," said Dr. Renee Weber, a planetary scientist at NASA's Marshall Space Flight Center, who led the team of researchers. "The moon's deepest interior, especially whether or not it has a core, has been a blind spot for seismologists," said Ed Garnero, a professor at Arizona State University and a member of the research team. "The seismic data from the old Apollo missions were too noisy to image the moon with any confidence." 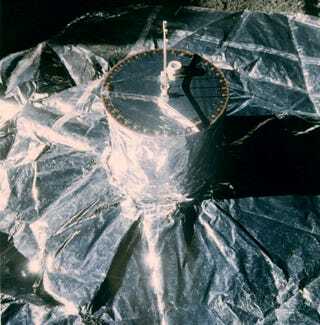 Weber and her colleagues re-analyzed the Apollo data using a method usually used for processing seismic data on Earth. Called array processing, seismic recordings are added together or "stacked" in a special way and studied together. The multiple recordings processed together allow researchers to extract very faint signals. The depth of layers that reflect seismic energy can be identified, ultimately signifying the composition and state of matter at varying depths. This method can enhance faint, hard-to-detect seismic signals by adding seismograms together. "If seismic wave energy goes down and bounces off of some deep interface at a particular depth, like the Moon's core-mantle boundary, then that signal "echo" should be present in all the recordings, even if below the background noise level," said Patty Lin, a postdoctoral candidate at ASU and another member of the team. "But when we add the signals together, that core reflection amplitude becomes visible, which lets us map the deep Moon." Weber told Universe Today that the shear waves do not penetrate fluid regions. "So while we have observed compression reflections off the solid inner core, we have not (as expected) observed shear reflections off the inner core, since that energy is reflected at the outer core layer." Recent studies suggested the Moon had a relatively small iron-rich core, sized between about 250 and 430 km, or roughly 15 to 25% of its 1,737.1 km mean radius. The new measurements put the core slightly larger. "We have placed the core-mantle boundary at a radius of 330 km, roughly 19% of the Moon's mean radius," Weber said in an email. The iron-rich core has a solid inner ball nearly 240 km (150 miles) in radius, and an 90 km (55-mile) thick outer fluid shell. The new research also points to volatile-depleted interior, with the lunar core containing a small percentage of light elements such as sulfur, similar to light elements in Earth's core – sulfur, oxygen and others. The retooled 30-year-old data also appears to confirm the the leading theory of how the Moon formed. "The presence of a melt layer and a molten outer core supports the widely-accepted large-impact model of lunar formation, which predicts that the Moon could have formed in a completely molten state," Weber said. This post by Nancy Atkinson originally appeared at Universe Today.